I was, indeed still am, a touch unsure as to whether this one really belongs in my gig blog. 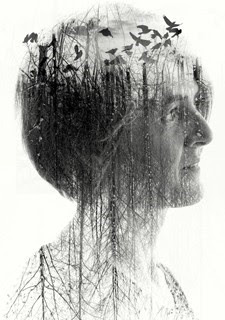 For although Karine Polwart is a folkie of some renown, this was some way from a conventional concert, being rather more of a theatrical performance, I suppose. We were certainly treated to a number of Karine's beautiful compositions, but there were also elements of poetry, prose and even dance woven into the tapestry. It was a One (Wo)man Show, the lady accompanying herself on acoustic guitar, harmonium and some odd circulur percussive device. But I decided, if I could find a place for Ivor Cutler in here, then Karine deserved admission too. The premise of the show ostensibly had Karine exploring her relationship with Fala Floor; that extensive peat bog situated some fifteen or so miles south of Edinburgh, close to where she presently lives, with particular reference to both the bird life and flora to be found there. Although in reality, the performance encompassed so much more than that, as Karine touched upon the ecology of the area, aspects of her own life story and, slightly incongruously, Aberdeen F.C. 's cup win in Gothenburg back in 1983. Intermingled throughout all of the above ran the strands of the tragic true story of Will and Roberta, a newlywed couple who lived on the moor just after World War I. And I for one, struggled to hide from Wife the single tear which ran down my cheek at the denuoment to the tale. At times the line between what was being performed live and what was on a backing taped blurred slightly confusingly, as Karine seamlessly drifted from song to spoken word and back again. But the show was never less than enthralling and, apart from Sneezy Dwarf to our right, the audience were entranced in rapt silence throughout. Even, at times, to the extent of not being sure whether to applaud at the end of each section, as the scenes progressed. But there was no doubting the warmth in the applause at the end of the show.